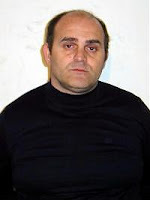 Raffaele Amato,"the principal, or one of the principal importers of cocaine into Italy", was arrested in Spain Saturday. He had been living under a false name in Spain's Costa del Sol. Amato had been head of a Camorra clan, Scissionisti di Secondigliano that had participated in a violent feud in recent years. The photograph comes from Wikipedia. Update: The Los Angeles Times provides extensive background on the Spanish milieu in which Amato and other Camorra operate.